MAJOR BREAKING NEWS: President Donald Trump has just announced that the United States will recognize Israel's sovereignty over the Golan Heights, which is internationally recognized as Syrian territory. And it is happening on the very day of Purim, the last Jewish festival of the year. This is being reported by varying outlets as the Trump administration laying the groundwork for Netanyahu's reelection campaign and the soon-to-be-unveiled Middle East peace plan. Understand that while this area should indeed belong to Israel, this is still a decision sure to inflame tensions with Syria, Russia, and Iran, which will not take kindly to the news that the status quo is changing. We seem to be hitting another "contraction" as it were—a sudden burst of prophetic activity (or Braxton Hicks, more properly). Just last night President Trump announced that Islamic State's caliphate has been fully defeated in terms of territorial possession... literally last night. There will no doubt be many declaring "peace and safety" in the Middle East because of the eradication of ISIS, which was a major threat to Syria, Iraq, the Middle East, and via affiliates—much of the western world. At the same time, UNSEALED identified that the skies are now back "in sync" with the year 2,000 at the turn of the millennium with the completion of one full metonic cycle. Yesterday was the change of Winter to Spring and we witnessed the first supermoon on a Spring equinox since the year 2,000. And today we pointed out that a number of prominent Jewish rabbis are emphatically declaring that the Messiah will make his appearance this Spring. Hallelujah! Come soon, Lord Jesus! TruNews' Rick Wiles is pretty much at war with anything pre-trib rapture or Israel focused end time prophecy. No surprise here. He calls us a cult and a heresy. Praise God ! I am so happy that God made today my day off because there is so much happening that's it's breath taking. This may be the lighting of the fuse that cracks open a can of prophecy stench with the Damascus destruction. As Gary said, this spells tension with Russia, Syria etc. Getting downright smelly around here. Did anyone notice just after the 17:22 mark in the video that Bibi referred to America as the new Rome? I thought that was very prophetic! When will the US actually recognize the full Israeli sovereignty of the Golan Heights? When that happens, will the Psalm 83 or the Ezekiel 38-39 war erupt? I think this was pretty official from an executive branch perspective. I'm not sure if congressional approval would be needed to "seal the deal" or not. Annabel, while I don't doubt the Mount Hermon aspects, Rick Wiles is known for being very anti-Israel/anti-Semitic. He also mocks those with a pre-trib view. Look at the comments on his TYC when he talks about Israel and you'll see who his followers are. Oh, I noticed Rick Wiles' doctrinal flaws when it comes to pre-trib. Yet I don't care about this here, this is about POLITICS. As far as "antisemitism" is concerned, well then you will probably also call the investigations of Steven & Jana Ben Nun (BOTH WITH JEWISH BACKGROUND) on the YouTube channel #ISRAELI NEWS LIVE as antisemitic. Wake up to reality dear friend and recognize who the people are who crucified the LORD Jesus Christ. Blessings to you! Did Bibi just refer to America as the new Rome? Wow, that was crazy! Gave me chills hearing him say that. He did... "the new Rome... the United States"
Even the beginnings of the country it was called such...Look up the early history of the US. It was the New Rome. Pompeo stated "it's possible that Trump was sent to save Israel from Iran". This is from an article on msn. In the article he said Trump is like a type of Esther to Isreal...are we living in biblical times or what! I go back and forth wondering if the Lord is coming back this spring or will He tarry to a later time like 2021. Either way He coming soon! FYI: Ok, so I originally found the article on msn, but I think the interview came from CBN. Looks like something is afoot. This takes it all a step even further. This is in your face. Antichrist making his rise to power anyone? They clearly are making their intentions known. I think I just heard a big, smelly, putrid can of prophecy power being opened. KATEEEESSSHH!! I just drank a whole can and I contracted a condition called Pompeo prophecy power poisoning. "Drink ye all of it!" (Matt. 26:27, KJV). Lol, I couldn't help myself. The KJV actually makes it sound like Jesus is talking about drinking the whole cup, when He most likely is referring to all of the disciples (see ESV, NASB, NET, etc.). Uuurrrrp!! Ahhhhh... excuse me one and all. If that had been done by any other representative of a former U.S. President, all hell or war would have broken out in the middle east. Trump's actions and "I don't care what other people think" attitude seems to have forced many in the middle east to resign themselves to whatever he wants to do. I think the Trump Tower comment in the article is just a jab only, but I definitely think Trump & Pompeo are helping Israel get that Temple up and given how fast things are moving, I'd say it will happen very soon. Maranatha! Indeed. The below article reveals that it was a cheap political act or "stunt," and that the person from the organization who did it made an apology and will be dealt with internally. But, given the prophetic hints that we see God dropping to the world i.e. "Trump," as in "Trump of God (rapture), this may well be another hint bomb from the Lord, regardless of whether or not it was a cheap political act. The Lord moves through people, including the wicked. This picture may well have been accepted intentionally regardless of their statement of a mistake for public consumption. We know how the Illuminati always reveal their intentions before they do it. Unbelievable: check out this New York Times article from last month about the U.S. Secretary of State. Scroll to the paragraph that begins "During Pompeo’s speech in Cairo..." and read to the end. wowsers...did I read it right when Pompeo noted (after visiting a new Mosque) that the Lord was doing a great work...?????? And Rosenburg????????? What a coincidence of the words today. 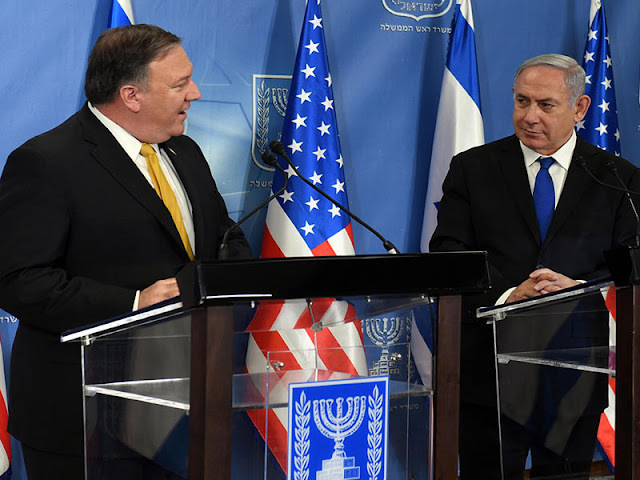 Pompeo - Pompey , That is why Netanyahu said that "his" last visit, and gesturing with his hands backwards is referring to Pompey of Rome. Smile!! Just a play of words. http://www.israelnationalnews.com/News/News.aspx/260761 "Syria vows to 'liberate' the Golan". Is the Golan the spoil Russia, Syria and Iran wants to take? Rick Wiles has good points, but he's also full of himself and some of his remarks you must take with a pinch of salt. He really hates the way America is being used and trampled on, and so should Americans. I don't get how so many Christians are on the coattail of Israel and Israeli politicians knowing that the Antichrist will rise out of this very state. Is Christians are foolish enough and deceived in thinking of Donald Trump is a Christian savior and not a new world order puppet, than they will be deceived by the Antichrist for sure. I think Christians these days have a stupid idea of what the Antichrist will look like. If he's going to deceive most Christians then you need to remember, he would probably be someone you would endorse or vote for. Does this deserve a bump on the Rapture Index meter? Great post Gary! Eyes to the skies brothers and sisters. Going vertical...soon! GREAT 'new' article (and videos) as usual by but-thatsjustme.com about the Noahide laws. First, I find it awesome and important because I had been considering posting a comment here about this... but I felt it might be taken as off topic. So now, as if by confirmation of an already known topic, I noticed the article on BTJM so here I am. Sorry it's not clickable but copy/paste or navigating the site from scratch is also easy. I've just completed a major prophecy update to my Hale-Bopp comet article in light of this development. For those who have already read the article, you can skip down to prophetic update number 4 titled "POMPEII AND POMPEO: THE 70 AND 9 CODE." Johnic....I am glad you removed your comment. That was as close to blasphemy I have seen. Is Trump setting himself, or herself, up to be Israel's strongest ally from 'New Rome?" Trump to do more for Israel than anyone else, thereby getting the approval of the Rabbi's as the messiah?? This is all surreal. It's like things are really happening, accelerating, and quickly. Also, in pop culture news, but also kind of eerie and related to end times stuff, a new movie called “Hellboy” is being released on April 12. In case anyone has not heard of the movie or the graphic novel series, this is about a demon from Hell who is chosen to save the world from an evil witch. I think this is possibly a move by Hollywood to attempt to deceive the masses into thinking that Satan is good and can save us, when in reality he is evil and is not a savior. I also find it interesting that this is being released at a time when there is a lot of turmoil in the world and, what I believe, we are close to the Rapture and might be close to the reveal of the Antichrist. Perhaps the AC will use this movie as perhaps propaganda for his evil empire? Very strange that this coincides with the Brexit on April 12. 144,000 or is it 144,000,000.? Anybody have deep information and or thoughts on value of 'myriad'. ?